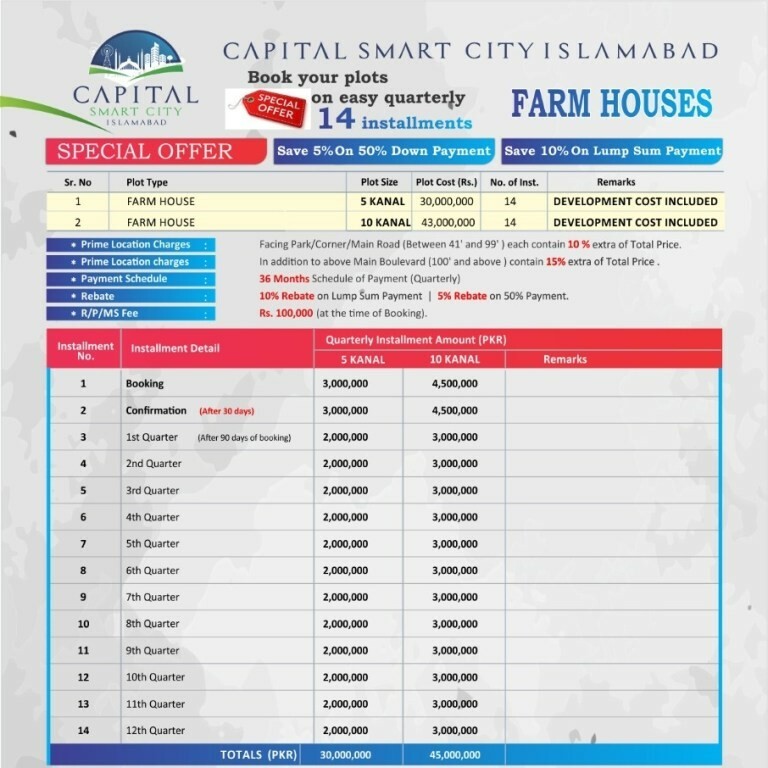 Capital Smart City Islamabad has come up with an exclusive offer of limited farmhouses on 3 years installment plan. The concept of living in a luxury farmhouse appeals to a majority of Pakistanis. Considering the capital city’s natural beauty and pleasant weather, possessing an Islamabad farmhouse will be nothing short of a dream. Capital Smart City Farmhouses won’t be like the ordinary agro farmhouses as they would have additional features for a luxury lifestyle; you can enjoy farming, riding, sports, swimming and a lot of other stuff. Capital Smart City Farmhouses are part of the master plan chalked out by Habib Rafiq (Pvt.) Ltd. And you’ll be able to enjoy all the smart features incorporated in the development plan including eco-friendly environment, automated security checks, an advanced integration of IT infrastructure in security and traffic control, smart transportation service, residents’ database management system, and many more features that make your life easier hassle-free. What makes Capital Smart City Farmhouse Standout? There are many different farmhouses in Islamabad where you will observe an organic environment but with a lack of modern facilities. ‘Gulberg Greens farmhouses’ does have modern facilities but it lacks organic environment and sporting facilities. Capital Smart City Farmhouses are an exception, they will be a complete package unlike the rest of the farmhouses in Islamabad. “Surbana Jurong” based in Singapore with extensive experience of planning housing projects across different continents and cultures, is the planner of Capital Smart City Farmhouses. Booking starts from 10% down payment, while the remaining amount is payable in 3 years through equal quarterly installments. It is important to mention here that the given prices include all development charges. If you want an Islamabad farmhouse which combines modern facilities with an organic environment, Capital Smart City farmhouse is the perfect option.